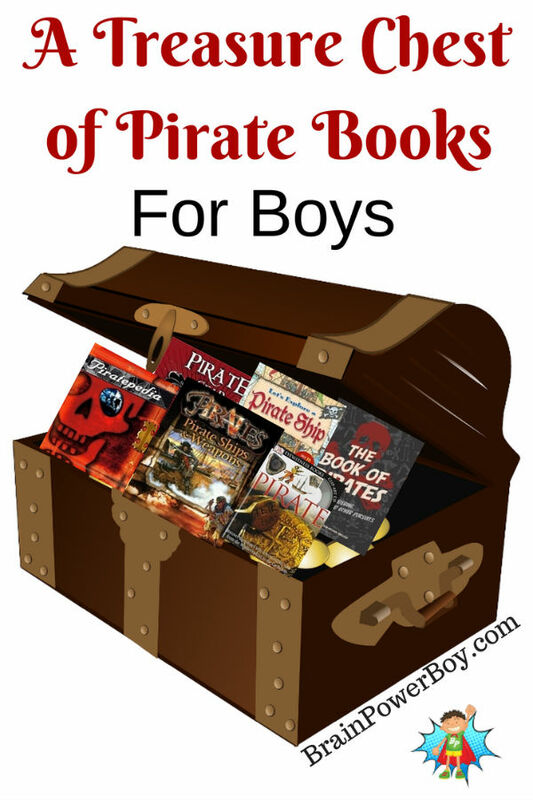 Best Books for Boys: Pirates! Many boys love pirates and all things piratey. We have rounded up the best books for boys about pirates. These are super books that boys will have a great time reading. The best part is that boys will also learn a lot about pirates, history, geography and more along the way. These books were chosen for readability, content, and attractiveness. Each book that makes one of our lists on Brain Power Boy is checked out to make sure it is really good. We went through a huge stack of pirate books and many didn’t make the cut. They were boring or they had information that wasn’t correct in them or the illustrations were terrible. Keep in mind that these are books about pirates. Pirates were not nice – 🙂 – so there is violence in the books. The books for younger buccaneers have less detail but some of them are still a bit violent. 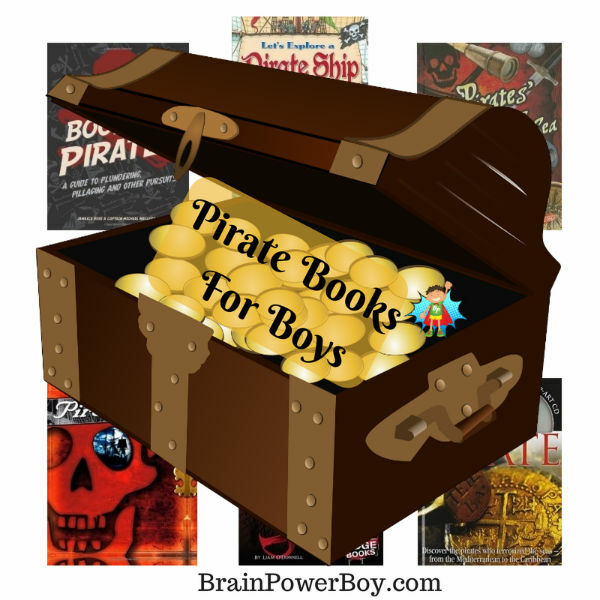 Best Books for Boys: Pirate Books! Let’s Explore a Pirate Ship by Nicholas Harris. Extremely detailed lift the flap book. You can lift the flaps but this is also a lift half of the ship book! On the next page is a smaller illustration of what was under the flaps. The author then goes into detail about the image in short text. Very engaging and well done. Great Warriors: Pirates by Kate Riggs. The text in this books is for younger boys but all boys are likely to enjoy the artwork included. I selected this for the artwork as the text is a bit lame at times such as, “Pirates used ships to get where they needed to go.” Well, yeah. The artwork makes it worth getting though. Pirate Ships & Weapons by John Hamilton. This is part of a series and it is quite good. I like that the author used longer text but still kept it interesting. The images are well done and include famous paintings by people such as Howard Pyle and pirate artist Don Maitz. There is a glossary at the back. These books are only available with library binding and that makes them more expensive. You might want to try your library to see if you can get them there. Also in this series: A History of Pirates , A Pirate’s Life , and Pirates in the Media . Pirate by Richard Platt; a DK, Eyewitness Book. If you have been reading along on Brain Power Boy you know that we love DK books here. Pirate is no exception. Super illustrations and descriptive yet short text make this a winner for boys. There are a lot of pirate topics covered here from the corsairs and privateers to weapons and treasure. It also comes with a Clip-Art CD which has individual images as well as small slide shows with images. Nice for making a pirate project. The Pirate’s Handbook: How to Become a Rogue of the High Seas by Margarette Lincoln. This is an older book that is totally worth seeking out. Rather short at under 30 pages long it is packed with info and fun activities as well. Make ship’s biscuits, buckles for your shoes, dubloons and more. It’s an informative yet fun read. Pirates’ Tools for Life at Sea by Cindy Jenson-Elliott. This book is part of a series. I like these books and think they would be great for an older boy who needs an easier read or for younger boys who can handle pirate details such as sawing off legs. Pirate Gear: Cannons, Swords, and the Jolly Roger (The Real World of Pirates) by Liam O’Donnell. Well done and entertaining while certainly teaching boys a thing or two about pirates this book is detailed and does tell it like it is. For example: regarding keelhauling: “The man was tied with a rope and pulled under the ship. Victim’s bodies were slashed by razonr-sharp barnacles, and most were drowned.” Factual. Others in this series: Pirate Ships: Sailing the High Seas , Pirate Treasure: Stolen Riches , and The Pirate Code: Life of a Pirate . These books also have library binding making them more expensive–seek them out at your library, me mateys! The Book of Pirates by Jamaica Rose and Captain Michael Macleod. Yup, a couple of “pirates” wrote the book and it’s subtitle is “A Guide to Plundering, Pillaging and Other Pursuists.” About 220 pages of pirate goodness is how I would describe this title. Major details and a ton of text (FYI) yet very approachable and easy to read. Funny little sayings throughout the book while at the time dispelling myths and giving great pirate info. There are activities such as “The Steps for a Basic Sword Drill.” and Cannonball snacks. This is a great book! Recommended for older boys. Piratepedia edited by Alisha Niehaus (DK books). I was reluctant to put this one on the list because I can only find it used but it is such a good book that I am including it anyway. It is a total bargain at under $4.00! (at the time of this writing–Amazon prices change rapidly) Piratepedia is very graphical in nature and it is very, very appealing to boys I know. There are images of splatters of blood about on some of the pages. If you have an older boy who likes pirates I think he will really like this title. And last, but certainly not least, The Amazing World of Pirates by Philip Steele. I liked this book so much when I found it some time back I reviewed it for the blog. We hope you enjoy the best books for boys, pirates list. Boys can learn a lot about history, and geography and much more by reading books about pirates. Argh, It Be Pirate Games! If you have younger buccaneers check this out. Follow Brain Power Boy on Pinterest. We share a whole lot of fun things for boys! My friends boys are coming up on birthdays and I was stuck for ideas – they LOVE pirates and so I’m going to treat them to a couple of these books – thanks for solving my problem! You are most welcome, Clare. I hope they enjoy the books.